In his book, “Please Stop Helping Us: How Liberals Make It Harder for Blacks to Succeed,” Jason L. Riley provides compelling historical evidence of how programs put forth in the 1960’s by architects of the Great Society indeed exacerbated issues facing family in the urban ghettos. He documents that marriage was penalized and single parenting subsidized as mothers were in effect paid by the government to keep fathers out of the home, and paid well. In 1965 about 25% of black children and 5% of white children lived in a household headed by a single mother. By 1985, the percentage of black children that lived in a household headed by a single mother doubled. Today more than 70% of all black births and 35% of all white births are born to unmarried women. With fathers absent, there is an avalanche of societal woes. Decades of studies have revealed that the likelihood of teen pregnancy, drug abuse, dropping out of school and other bad social outcomes increase dramatically when fathers are not around. Mr. Riley cites one of the most comprehensive studies ever done on juvenile delinquency – by William Comanor and Llad Phillips of the University of California, Santa Barbara, in 2002 – that concluded “the most critical factor affecting the prospect that a male youth will encounter the criminal justice system is the presence of his father in the home.” All other factors, including family income, are much less important. Dads need to stay in family! Honor your father and your mother, so that you may live long in the land the Lord your God is giving you. – Exodus 20:12. Listen my son to your father’s instruction and do not forsake your mother’s teaching. – Proverbs 6:20. My son, keep your father’s commands and do not forsake your mother’s teaching. – Proverbs 6:20. Has not the Lord made them one (in marriage)? In flesh and spirit they are His. And why one? Because He was seeking godly offspring. – Malachi 2:15. 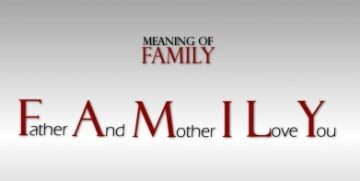 The Word is that mom and dad are to be honored and that it takes both in marriage to raise children. This is the model for all time. Everything else falls short and in fact introduces a host of societal ills. Dads need to stay in family and lead spiritually by example. A godly marriage provides the grounding to raise godly offspring that will navigate well through the noise in this world. Lead the way to church and lead spiritual discussion in the home between Sundays. Prayer guide: Lord, I confess my understanding of commitment in the marriage relationship and family was weakened by divorce in the home I grew up in. Forgive me for allowing the world to influence my perspective on marriage and family. Thank You for getting my attention through the valleys You allowed me to endure. In a personal relationship with You, I am grounded with a clear understanding of what real relationship is, how I am to live that relationship in marriage and reflect it in family. Amen. A faithful father stays in family for the sake of raising a godly generation. Amen to this message! I wish there was a way that it could be effectively communicated to the masses.